Bierman, P. R., (in review), Clearcutting, Reforestation, and the coming of the Interstate: Vermont's Photographic Record of Landscape Use and Response, in Repeat Photography: Methods and Applications in the Geological and Ecological Sciences, Webb, R. H., Boyer, D.E., and Turner, R.M. (eds), Cambridge University Press. Massey, C.A. and Bierman, P.R. (2007). Teachers and kids dig old photos , National Association for Gifted Children Journal. Bierman, P.R. (2006). Setting as Character: Vermont's Landscape, Stories, and Sense of Place, Vermont Humanities Council Annual Meeting, Keynote Presentation, Killington, Vermont. November, 2006. Presentation (7.3 MB pdf). Massey, C.A. and Bierman, P.R. (2006). Historic Landscape Photographs Inspire Local Teachers to Create Engaging Curricula, Geological Society of America Abstracts with Programs, 38 (7), p. 190. Presentation (16.8 MB pdf). Agne, Russell M. (2005/2006). Sustainability in Vermont's K-12 Stndards-Based Curriculum Framework, The International Journal of Environmental, Ccltural, Economic & Social Sustainability (Vol 1). Bierman, P.R., Howe, J., Stanley-Mann, E., Peabody, M., Hilke, J., and Massey, C.A., (2005). Old images record landscape change through time, GSA Today. v. 15, n. 4, 10:1130/1052-5173(2005)015, p.1-6. Massey, C.A., Bierman, P.R., Lavoie, J.P., Manduca, C.A., Berrizbeitia, I., and Henry, J. (2005). Learning Visually with Historic "Geo-images", Geological Society of America Abstracts with Programs, 37, (7), p.150. Presentation (7.9 MB pdf). Bierman, P., and Massey, C. (2005). How a modest REU supplement led to a paper in GSA Today, Geological Society of America Abstracts with Programs, 37 (7), p.492. Presentation (55.2 MB pdf). Bierman, P., Massey, C., and Hilke, J., (2004). The landscape change program: a community digital archive of Vermont landscape imagery, Vermont Geological Society winter meeting. Stanley-Mann, E., Hilke, J., Bierman, P., and Worley, I. (2004). Repeat photography documents landscape change 75 years after an horrendous flood , Geological Society of America Abstracts with Programs (National), 35 (7), p. 249-42. Presentation (0.4 MB pdf). Bierman, P., Stanley-Mann, E., Howe, J., Peabody, M., Hilke, J. and Massey, C. (2004). A web-based time machine -- picturing two centuries of landscape change, Geological Society of America Abstracts with Programs, 36 (5), p. 214. Presentation (6.0 MB pdf). Hilke, J. (2004). Old fields, forests, and farmland: Using historic photographs to show changes in Vermont's landscape. Annual meeting presentation, Center for Research on Vermont Movie (531 MB streaming video). Massey, C., Hilke, J., and Bierman, P.R. (2003). Landscape metamorphism in Vermont: Building an image archive of the past and present with students, historical societies, and towns. Geological Society of America Abstracts with Programs, 35 (6), p. 121. Presentation (6.6 MB pdf). Kurfis, J., Bierman, P., Nichols, K., Persico, L., Melillo, P. (2001). Green university town succumbs to blacktop: Quantifying the increase in impermeable surfaces and runoff through time, Geological Society of America Abstracts with Programs (National), 32(7), A-179. Presentation (2.5 MB pdf). Bierman, P.R. (2000). Henry's Land, in The Earth Around Us: Maintaining A Livable Planet, J. Schniederman, ed., Freeman, p. 47-56. Massey, C. A., Mallard, L. D., Bierman, P. R. (2000). 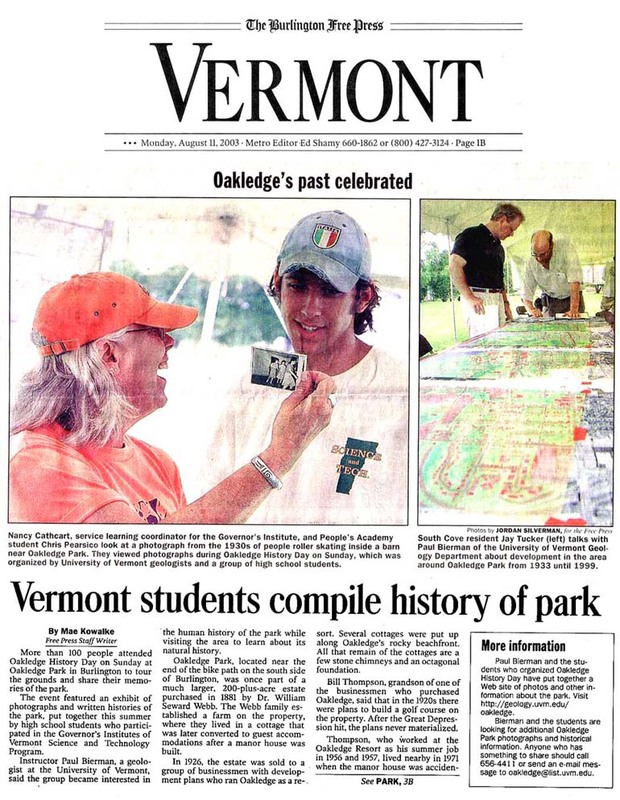 Digital archive of human-induced landscape change with K-16 students in Vermont, Geological Society of America Abstracts with Programs (National), 32 (7), p. A-204. Presentation (7.0 MB pdf).